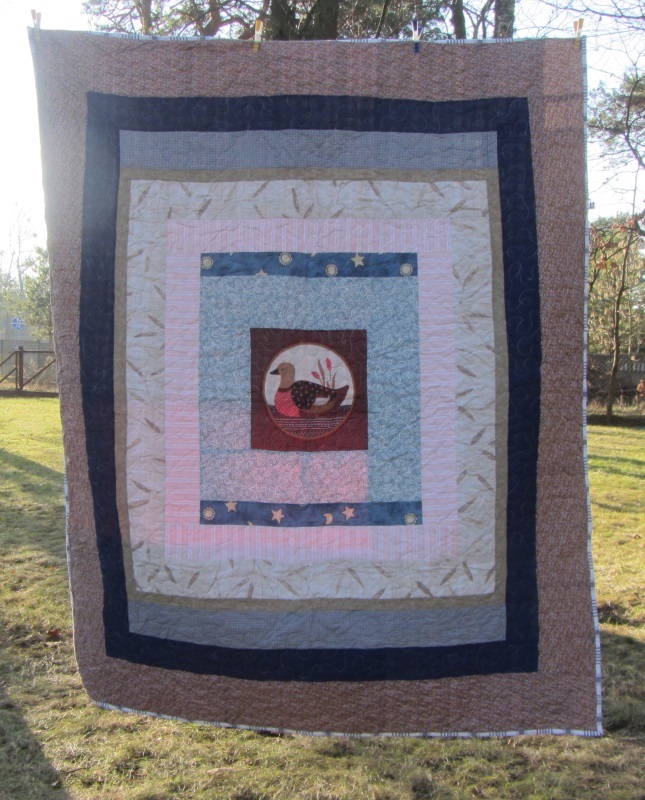 Someone recently suggested to me that I make some whole cloth charity quilts as sometimes fabric is just too beautiful to cut up. It's a very good idea. Along that line, I've asked my sis for some panels because they are, well, quite frankly, really nice, and people like them - and they are easy. I've been really happy when I've been able to find a nice duvet cover in good condition that I could cut apart and use as is. I've done it a few times. I have also used panels - esp. Spiderman and a few other kid themed ones. I do have a lot of pillow panels yet to use, but they take a lot more work. But let me show you a few of these from other years. A second-hand duvet cover. It was still nice and bright - almost brand new when I found it. This curtain fabric looked very Scandenavian - but I liked it. So I just bordered it and called it good. A panel from the states. A pillow panel. I had quite a time making this one big enough - and no, I don't have a pattern - I just really "winged it". Winnie the Pooh's friends - a classic. I had to add some borders to make it the size I needed, though. It was a second-hand duvet cover. I had to check with my son to make sure this was an "okay" theme for me to give away. He told me it was fine. 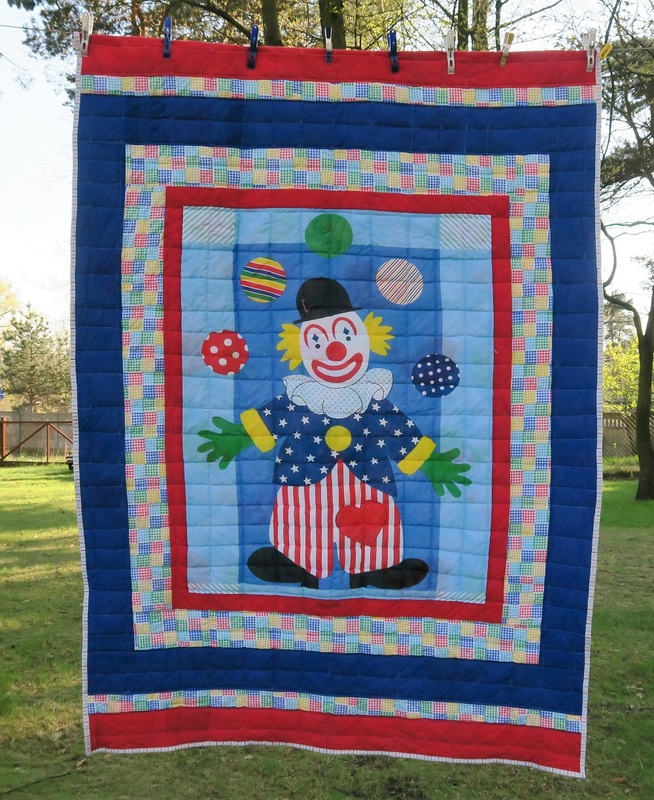 A man took this quilt - he was quite happy with it. (It was a duvet cover). This cute duvet cover was basically brand new when I found it. 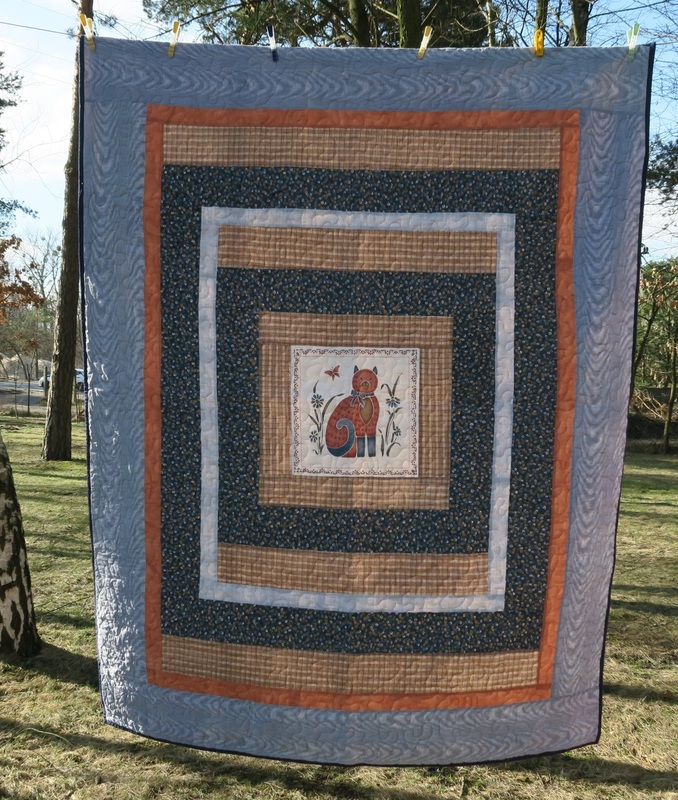 I found this duvet cover quite a while ago - finished it before I had the line outside for hanging quilts - I think this is from 2013. These pillow panels almost wiped me out of my browns at the time. And yes, men, took all of these dark ones. 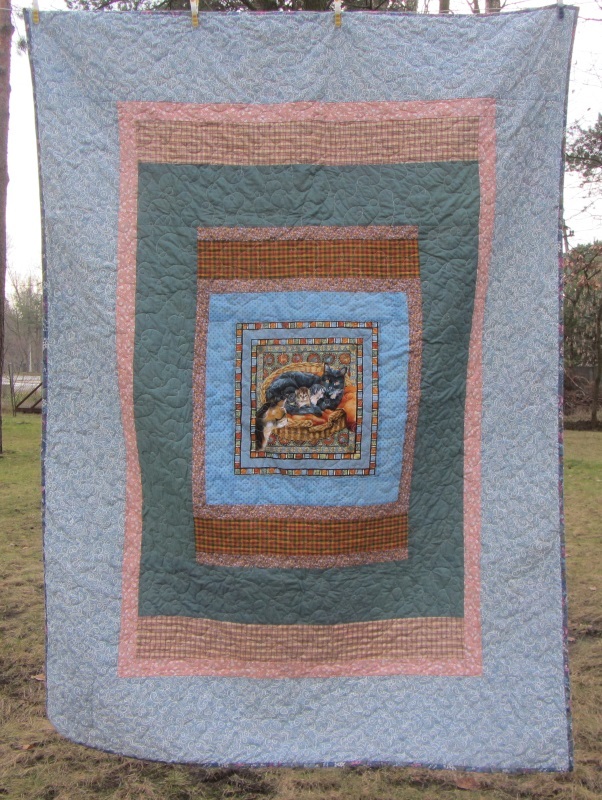 These horses made a fine quilt! It was a duvet cover. A duvet cover - made into a quilt. I had found a bunch of these Spiderman panels back a few years ago on Ebay. I brought them over in my suitcase and finished them to give away. All were slightly different. I didn't have as many Batman panels as Spiderman - and I really liked them! Everyone from teenage girls/guys to little kids took them! I thought this angel was really cute! All these darker ones with animals in the center were taken by men. They really did like them! 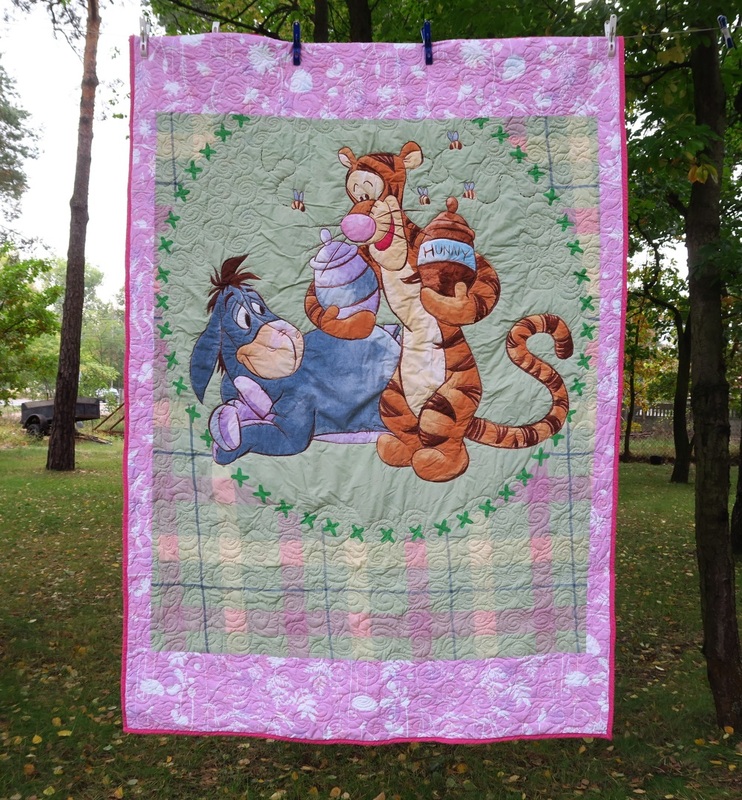 I will have one coming up soon to show you (it's been washed but not photographed) where I actually did use just some fabric I found here in Poland - some rather large soccer players - and I just quilted it. The fabric wasn't very special though (quality wise) and so I'm not thrilled with it. These duvet covers, for the most part had much better fabric than that one. You'll see it in the next 2-3 weeks if you hang around here. As I've started putting some bigger prints on the back - and not using up my "worse fabric" - (it's gone) - which makes the charity quilts reversible - with a pieced front and a big print such as these - on the back. I like it and I think the Polish people do as well. And now you know! I'm always on the lookout for something fun to make into a charity quilt. I try to keep it to something I wouldn't mind my kids having. As such, most movie stars and pop figures aren't going to be made into a quilt by me as I don't consider most of them decent role models. You are free to differ! But if you need something for your current project, be sure to check out what my sis has for you over in the store!